Louie is a former pet from Virginia and arrived at the PRC in 2004 at the age of 2. 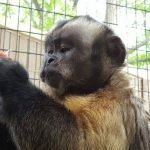 Louie fit in well with our established Capuchin group, bonding with everyone and quickly rising to be the dominant group member. Louie is a very athletic and hearty monkey, but he does not use his larger size to intimidate his fellow group members.